As the nights draw in, it’s the right time of the year to sit in front of the fireplace and enjoy a good cup of tea and a biscuit or two while the wind and rain wail outside. Independent Bristol-based company Lahloo Tea praises the modest British ritual of tea and biscuits by turning November into the Tea and Biscuit Month, complete with the celebration of the Great Dunking Debate on Thursday the 22nd. Throughout November, Lahloo will offer 20% off all their black teas, and Lahloo Pantry will serve a selection of mouthwatering biscuits made in the kitchen to accompany Lahloo’s fine loose-leaf teas. 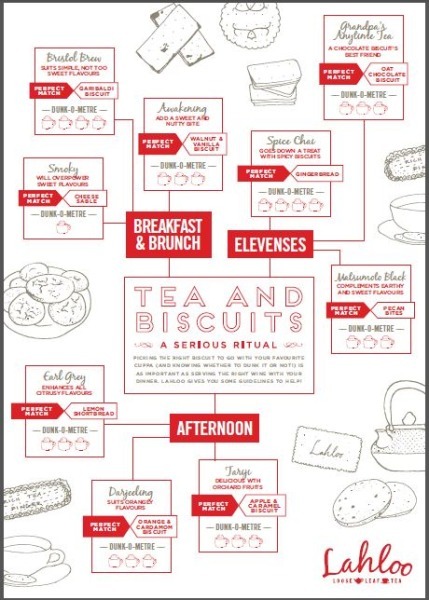 The rules of tea and biscuit pairing and the pros and cons of dunking will be explored at the Great Dunking Debate, held at Lahloo Pantry on the 22nd. During the evening, guests will be able to try Lahloo’s selection of opulent black teas and Lahloo Pantry’s homemade biscuits, discussing whether it’s best to dunk or not to dunk. The event is free, but places are limited, so booking is necessary. In the same way in which you wouldn’t dream of drinking red wine with your haddock chowder, the tea that suits your lemon shortbread might be spoiled by a ginger nut. To help you get the pairings right, Lahloo founder Kate Gover suggests these combos. The über-popular Bristol Brew, a hearty and vibrant Assam, is one of Lahloo’s best sellers and a favourite of those who like a traditional cuppa. The thin, golden and humble Garibaldi biscuit, popular for over 150 years, matches its character to perfection. Fruity but not too sweet, Garibaldis are great for dunking, and Bristol Brew, great with or without milk, lends itself to it. The zesty Earl Grey, aromatised with pure Sicilian bergamot essential oil, is another popular choice for both breakfast and afternoon tea. This British classic complements and enhances all citrusy flavours, so its perfect match would be crumbly, crispy lemon shortbread. Also ideal for dunking! The champagne of teas is the jewel in the crown of a classic afternoon tea, and it pairs well with orangey flavours. For a delicate, exotic note, reminiscent of the origins of Darjeeling, add cardamom to the biscuit. Lahloo’s take on Lapsang Souchong is a velvety, subtly spicy black tea smoked over cinnamon wood. Strong and rugged, it would quickly overpower most sweet flavours. A savoury, flaky and rich cheese sablé with walnuts or pecans has the right consistency and the required punchy flavour – just don’t dunk it, unless you like your tea cheesy! The rich and satisfying Grandpa’s Anytime Tea, named after 112-year-old Kenyan farmer Arthur, is a blend superior to most breakfast teas that can be enjoyed with or without milk. The rustic texture and earthy, sweet flavour of an oaty chocolate biscuit paired up with this tea hero are ideal for elevenses. 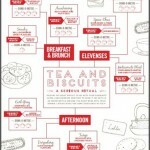 For more information on the Tea and Biscuit month, to join the Great Dunking Debate and to browse the biscuit recipes specially crafted by the kitchen at Lahloo Pantry, you can visit the Lahloo Tea blog on www.lahlootea.wordpress.com or follow @lahlootea on Twitter.